A little over two years ago, when the Commerce Department officially announced plans to "relinquish control" over ICANN's IANA (Internet Assigned Numbers Authority) we tried to explain why people should stop freaking out. There were a bunch of people up in arms, claiming that the US government was "giving away the internet." That was, and still is, complete hogwash. There are two important things to understand in this. First, the Commerce Department's "oversight" over ICANN and IANA is already basically non-existent. It was always more on paper than in reality, as the Commerce Department, rightly, took a totally hands off approach. Second, there has been a big effort by foreign governments, mainly Russia and China, to take control over the internet, and strip it from ICANN, and putting it in the ITU, a confusing mess of an organization that's a part of the UN, but heavily controlled by governments without input from actual technologists or public interest groups. A key part of the Commerce Department's "transition" plan was that it would basically erase the almost entirely imaginary link between IANA and the Commerce Department, but only if a plan was created that kept IANA independent and not as a part of the UN or any organization that would lead to mostly government control, as opposed to what everyone (unfortunately) likes to call a "multistakeholder process" (which just means not just government in the room). And with that plan in place, the Commerce Department's National Telecommunications & Information Administration (NTIA) has now come out in support of this plan. The U.S. Commerce Department’s National Telecommunications and Information Administration (NTIA) announced today that the proposal developed by the global Internet multistakeholder community meets the criteria NTIA outlined in March 2014 when it stated its intent to transition the U.S. Government’s stewardship role for the Internet domain name system (DNS) technical functions, known as the Internet Assigned Numbers Authority (IANA) functions. The announcement marks an important milestone in the U.S. Government’s effort to complete the transition of the Internet’s domain name system and ensure that the Internet remains a platform for innovation, economic growth, and free speech. For the last 18 years, the United States has worked with businesses, technical experts, governments, and civil society groups to establish a multistakeholder, private-sector led system for the global coordination of the DNS. To accomplish this goal, in 1998, NTIA partnered with the Internet Corporation for Assigned Names and Numbers (ICANN), a California-based nonprofit, to transition technical DNS coordination and management functions to the private sector. In 2014, NTIA initiated the final step in the privatization process by asking ICANN to convene global stakeholders to develop a plan to complete the transition away from NTIA’s remaining legacy role. Now, you would think that "small government" types would be happy about the US government completing its "privatization" of internet governance. But, that's because many "small government" types are only small government types when it suits them. Senate Ted Cruz and Rep. Sean Duffy have rushed out a bill, called the "Protecting Internet Freedom Act" that would block the Commerce Department from completing the privatization of the internet. This is both silly and counterproductive. The Commerce Department's flimsy and never really used "control" over NTIA is basically meaningless yet it's frequently used by foreign governments and the ITU/UN as a reason for taking complete control over the IANA process. And that's only ramped up in recent years due to concerns about the NSA and surveillance. In other words, the US having any official control over internet governance is actually helping authoritarian governments by making the argument that US "control" over the internet is only helping the NSA. By separating IANA from the US government, but keeping the overall process as one that is not controlled by any government, you actually have a better chance of keeping the internet functioning in an open manner. Leaving it under the US government control, no matter how flimsy that link really is, only gives foreign governments useful fodder for a more complete move to take over control themselves. In truth, authoritarian regimes would love nothing more than to see the IANA transition fail. It would give them another shot at taking the issue to the ITU, this time with the added ammunition of pointing out that the United States does not keep its word regarding Internet governance. Oddly, this places Cruz and Duffy on the same side as Russia and China, against the world’s democracies, the Obama administration, sober Republicans, virtually every US tech company, the Internet Society, and virtually every freedom-loving intellectual or activist I have met who has participated on a US delegation to the ITU. Separately, he also points out that for all the hype over this, the IANA function is actually not nearly as important as some make it out to be. The US government losing whatever sense of "control" it had over it is unlikely to have a huge impact on the internet itself. So the "costs" to this transition are basically nil. The cost to keeping the paper control in place, however, may be very large, in that it provides tremendous ammunition to foreign authoritarian regimes to push for much more extreme changes to internet governance that would be much, much worse. This was rumored for a while, but the Commerce Department has now said that it will be "relinquishing" its "control" over ICANN's IANA, which administers the basic structure of the internet domain system. You can read the details here. Of course, the US government's "control" over ICANN/IANA has always been a lot more on paper than in reality. From the beginning, while the Commerce Department technically had oversight concerning ICANN, it had always been careful to live up to its promise that ICANN was to be independent of the US government. So, while some are making a big deal over this, it's unclear if it will really matter that much. The big fear over the past few years was that certain foreign interests -- lead by authoritarian regimes in China and Russia (with long track records of censoring the internet and stifling dissent) -- would take control of the internet away from ICANN via the ITU, an organization that's a part of the UN. That was extremely problematic on a number of levels, given in part that the ITU process is entirely controlled by country governments without input from other stakeholders, such as technologists. ICANN is far from perfect (very, very, very, very, very far from perfect), but the ITU would be significantly worse. However, from what's being said, it appears that the Commerce Department's plan is conditional on the UN/ITU not getting control, and for internet governance to remain a multi-stakeholder process, rather than one solely controlled by governments. U.S. officials set strict conditions and an indeterminate timeline for the transition from federal government authority, saying that a new oversight body must be created and win the trust of crucial stakeholders around the world, said Lawrence Strickling, a top Commerce Department official. The announcement essentially ruled out the possibility that the United Nations would take over the U.S. role, something many nations have advocated and U.S. officials have long opposed. That's a good thing. From what's being said, it sounds like the Commerce Department would like ICANN to continue more or less the way it has been running, just without the official claim to being overseen by the Commerce Department. Could that lead to troubles down the road? Sure. But, frankly, the US more or less forced itself into this position with its idiotic decision to let the NSA spy on everything. Before that, plenty of other countries were happy with de facto US "control" over the internet. But once it became clear just how deep the NSA's claws were within the internet, even former allies began to demand changes. While the ICANN model can be improved upon (greatly), it can also be much, much worse. So where this goes will need to be watched closely. But, on a first pass, simply taking the Commerce Department's name off of things should have little direct impact for the time being. And, of course, it's worth remembering, that before ICANN, the internet was more or less governed (benevolently) by this guy. There was plenty of attention paid to the failed WCIT meeting last year, in which some countries effectively sought greater control over the internet, leading many countries to refuse to sign on. There has since been plenty of reasonable concern that the end result of this is a fragmented internet, with one internet for those who believe in internet freedom and openness... and one for those who don't. And, of course, the whole ITU WCIT process was never going to be the end of such discussions. Eli Dourado, who has been following this stuff closely for a while, recently had a good report about how various authoritarian governments made a bit of a power play for more control over internet governance. The issue may seem bureaucratic and messy, but that's also why it's important to pay attention. Because mixed in with all that bureaucracy are some key decisions. The short version is that countries agreed, nearly a decade ago, at the World Summit on Information Society, that governments shouldn't have too much control over the internet. This was initially directed at the US, since it really did have an awful lot of power over the internet. So, an agreement was reached with the following language on a "multi-stakeholder model." "The international management of the Internet should be multilateral, transparent and democratic, with the full involvement of governments, the private sector, civil society and international organizations." As Dourado points out, "note the four classes of stakeholders." They were chosen this way to avoid governments having too much power. Except that certain countries are using these various international gatherings to try to change the meaning of "multi-stakeholder" to basically minimize everyone but government, while still pretending to support the concept. Authoritarian governments have been quick to remind the world that they are stakeholders, too. Since the Tunis Agenda urges all stakeholders to work together "in their respective roles," the most illiberal countries have simply argued that national governments should have the biggest and most pre-eminent roles, while other stakeholders should have smaller subordinate ones. Russia in particular is aggressively pushing this definition for the role of governments. Its proposed edits to the multi-stakeholder opinion invites member states "to exercise their rights on Internet Governance ... at the national level," by which it means that national governments should preempt ICANN. In other words, Russia -- and its allies like China and Saudi Arabia -- are adopting the language of multi-stakeholderism to support something rather like its opposite. The position they are advancing is virtually indistinguishable from one which accords no role to other stakeholders. Dourado also points out that having governments make decisions on internet governance is a recipe for disaster in a number of ways, including the fact that current internet governance is earned through trust and respect -- but governments swooping in don't seem to care about any of that. ... it is worth reflecting on one fundamental difference between Internet institutions and sovereign governments. In the Internet technical community, authority is earned. Internet institutions have legitimacy because it is freely given by a wide array of stakeholders. For example, the non-governmental Internet Engineering Task Force (IETF) maintains and develops the core technical standards that are the sine qua non of the Internet. People are free to disobey the recommendations issued by the IETF, but they usually follow them because it has earned its authority through competence, transparency, and inclusiveness. The system of state sovereignty is at odds with the earned authority of Internet institutions. Governments punish their subjects for failing to comply with their orders, and they do not accept challenges to their territorial authority. Governmental authority is not earned; it is imposed. Neither the authoritarian regimes nor the ITU seem genuinely invested in earning the authority they are eager to assert on the Internet. Instead, they are using the vagueness of the nominal consensus on the multi-stakeholder model as cover to impose authority. Will The ITU's Increasing Focus On Control And Surveillance Split The Internet? Techdirt covered the WCIT circus in Dubai in some depth last year, since important issues were at stake. As many feared, after a moment of farce, it became clear that a serious schism in the ITU was opening up -- between those who wanted the Internet largely left alone to carry on much as before, with the possibly naïve hope that it might act as a vehicle of freedom, and those who wanted it regulated more closely, certain it could become an even better instrument of control. Although WCIT is over, the ITU journey continues, and a fascinating post by Anthony Rutkowski on the CircleID Web site gives us a glimpse of where exactly it's heading -- and it doesn't look good. The ITU's "Internet/cloud" Study Group 13 is convening soon, and as Rutkowski points out, the provenance of the contributions submitted to this meeting reflect what is happening to the organization: 70% of them are from China or Korea. Almost everyone has fled the organization except for a few established participants from China and Korea and their partners. Pretty much all of industry together with the G55 nations [who refused to sign the WCIT treaty] have left. The contributions predominantly deal with the mechanics of pervasive surveillance and content control. This includes DPI mechanisms and use cases, filtering of content to local networks, control of individual user mobile phones, controls on peer-to-peer services, extensive regulatory controls on cloud computing facilities, and Big Data Analytics for extracting every nuance about individual users from real-time communications and stored data. As Rutkowski rightly notes, given this continuing descent into police-state territory, there are now two paths for the ITU. The first is to pull back from the brink, and to return to a consensus-based approach that allows the G55 nations to participate in the development of basic Internet standards -- not those predominantly designed for surveillance. Alternatively, the G89 nations who did sign the WCIT treaty may decide it is more important for their sections of the Internet to be firmly under their control than for there to be a single, unified set of Internet standards for the world. The schism would be formalized, with a more open G55 Internet linking up as best it could with the more closed G89 network. That would be a tragedy for humanity, but on the basis of the WCIT conference and the developments since then, it's certainly not something that can be ruled out. We already noted this morning that the US, a bunch of European countries, and a sprinkling of other nations around the globe have refused to sign the new ITR agreement put together at the ITU's World Conference on International Telecommunications (WCIT), even as ITU officials congratulate themselves on a job well done. Many people have asked who signed and who didn't. 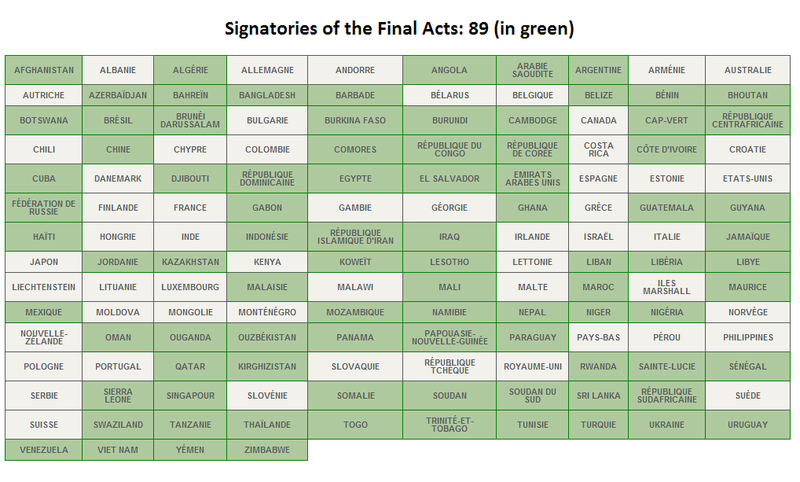 The ITU has an official list of signatures, which seems to slightly conflict with some earlier reports. 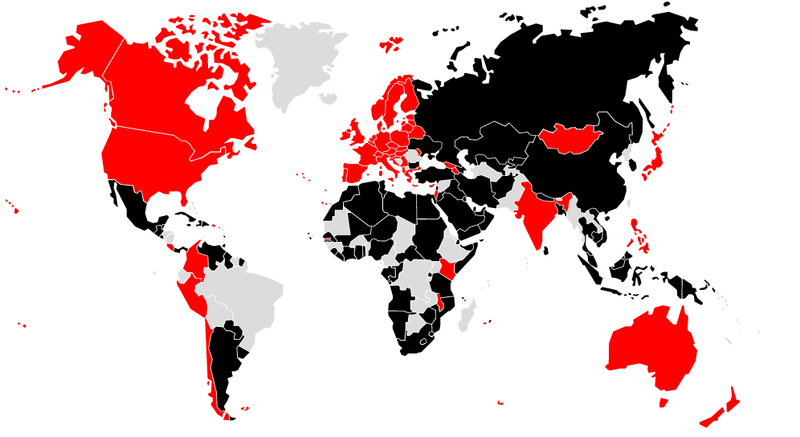 Here's their graphic: Perhaps more useful is this map, in which the signing countries are in black and the non-signing are in red. You might notice a few patterns. Also, reporter Dave Burstein kindly sent along the full list (embedded below), with signatories in green, non-signatories in red and everyone else in white. The "everyone else" apparently includes countries who haven't paid up their dues and thus can't technically sign on yet, or who don't "have their credentials in order." In other words: bureaucratic blah blah blah. Europe, of course, dominates the non-signing countries. It's somewhat meaningless, but if you tally up population, the signatories cover 3.8 billion people, while the non-signatories cover 2.6 billion. And there are another ~600 million in play in those other countries. So, what does it all mean? Very little right now. Even those countries that signed on still need to go through a ratification process -- and one hopes that people in some of those countries will realize that it's bad to be supporting a regime that wants political bureaucrats having anything to do with the internet, even if it's dipping a toe in the water. However, many of the countries don't much care about that, and simply want the new rules so they can try to control parts of the internet (and/or profit from it). The rules won't actually go into effect for a while. While they aren't binding, it is pretty customary for signatories to eventually adopt such rules locally. The real story here is a world in which there are two competing visions for the future of the internet -- one driven by countries who believe the internet should be more open and free... and one driven by the opposite. Whether or not the ITU treaty is ever meaningful or effective, these two visions of the internet are unlikely to go away any time soon. The next decade is going to be filled with similar clashes as certain countries seek to limit what the internet can do, for their own political needs and desires. Seeing the initial breakdown of who's in which camp is useful, but this isn't over yet. The ITU's World Conference on International Telecommunications (WCIT) is now over... and it played out almost exactly as many had predicted. After going back on explicit promises that the treaty would (a) not be about the internet and (b) would only be completed by consensus, rather than by majority vote -- the US lived up to its promise not to support such a treaty by officially stating that it would not sign. A number of other countries quickly followed suit including: the UK, Canada, Denmark, Australia, Norway, Costa Rica, Serbia, Greece, Finland, Italy, Japan, Kenya, Sweden, New Zealand, the Czech Republic, Slovenia, the Netherlands, Poland, Portugal and Qatar (though some apparently said they could not sign because they first had to consult with their own governments -- so it's possible that some of these may change their mind, but many viewed such statements as a more diplomatic way of refusing to sign). "It's with a heavy heart and a sense of missed opportunities that the US must communicate that it's not able to sign the agreement in the current form," said US Ambassador to WCIT Terry Kramer. "The Internet has given the world unimaginable economic and social benefit during these past 24 years. All without UN regulation. We candidly cannot support an ITU Treaty that is inconsistent with the multi-stakeholder model of Internet governance," Kramer added. The US delegation also laid out the specific reasons why it refused to sign, and they're the same issues we've been talking about all along: (1) the attempt to expand the definition of the types of entities covered by the treaty from the big telcos to just about everyone running network (2) the explicit inclusion of internet and internet governance in the treaty (3) the claim of a mandate over cybersecurity and (4) the official regulation of spam. That last one hasn't received as much attention, but the US found the rules put forth for dealing with spam going way too far, and putting in place rules that would violate the First Amendment. I couldn’t imagine they wouldn’t sign it. I especially was surprised by the reasons that were put in place. I had made it clear from the opening that [Internet and content were not a part of the discussion]. I invited ICANN to show that we want to build bridges. The telecoms society and internet society need to work together. I made an appeal to please help us build bridges. The fighting will not help the consumer that we are trying to reach here. I have been saying in the run up to this conference that this conference is not about governing the Internet. I repeat that the conference did NOT include provisions on the Internet in the treaty text. Annexed to the treaty is a non-binding Resolution which aims at fostering the development and growth of the internet – a task that ITU has contributed significantly to since the beginning of the Internet era, and a task that is central to the ITU’s mandate to connect the world, a world that today still has two thirds of its population without Internet access. So it's not about the internet, but the internet is central to the ITU's mandate. Of course, this claim is also a lie. The ITU's mandate does not cover the internet, but telecom infrastructure. One of the more nefarious moves by Toure and the ITU in this whole process was to continually blur the lines between telecom infrastructure and the internet, as if they were one and the same. The word “Internet” was repeated throughout this conference and I believe this is simply a recognition of the current reality – the two worlds of telecommunications and Internet are inextricably linked. I demonstrated that from the very beginning by inviting my friend Fadi Chehadé, the CEO of ICANN, to address our conference at the beginning. So... again, he's saying two different things. First, he claims that the treaty has nothing to do with the internet, and then insists that telecommunications and the internet are "inextricably linked," which explains why the treaty pretty clearly would impact internet governance -- which is why so many nations are refusing to sign. History will show that this conference has achieved something extremely important. It has succeeded in bringing unprecedented public attention to the different and important perspectives that govern global communications. There is not one single world view but several, and these views need to be accommodated and engaged. WCIT has shown us this truth and we have worked hard together to find a way that is acceptable to all. Let WCIT be the beginning of this dialogue. As our two worlds increasingly converge so must we increasingly converse and find a common way. To be honest, this feels like a speech that was written before the events of the past two weeks, perhaps at that secret meeting to plan its media strategy. To sit there and claim that WCIT was about finding a way "acceptable to all" and one in which the focus was on "finding a common way" is especially laughable, given how the whole thing concluded. History may very well show that something extremely important was achieved, but it may just be that the achievement was demonstrating clearly what a charade the ITU is, and making it clear that it is not the right organization to have anything to do with internet issues. The ITU has been shown, once again, to be an out-of-date, out-of-touch, obsolete organization searching for relevance. The simple fact is that the world does not need an ITU to "enable" the internet. The internet was built and expanded rapidly through other means, driven by demand and what it enabled people to do. The current system is not perfect, by any stretch of the imagination, but it has been working, and shifting to a model driven by international bureaucrats was never in the cards. The internet does not need the ITU. The ITU needed the internet to remain relevant. The internet, however, does not work that way, and any attempt to move it into such a system of bureaucratic oversight was doomed from the start. But we should not confuse telecommunications infrastructure with the information that traverses it. The global consensus for a free and open Internet is overwhelming. Millions in the United States and around the world have already added their voices to this conversation, and their position is clear: they do not want the WCIT to govern the Internet or legitimize more state control over online content. Our Administration could not agree more – and will not support a treaty that sets that kind of precedent. This is the key point. Many in the ITU seem to want to blur the distinction between the infrastructure itself and the information that runs over it. They believe that their mandate over "telecommunications" includes the specific "communications" that run over those networks. That's a massive rewriting of history. Their mandate is supposed to be focused on the technological infrastructure, rather than how it is used. "The majority is with having the resolution in...The majority agreed to adopt the resolution as amended." "In the true tradition of the ITU, we will not vote on any issues," Toure told reporters over the summer. "Voting means winners and losers, and this is not simply acceptable. And we believe that we'll come to an agreement on all of the issues." Toure had said last week that the summit "is not about Internet governance." But after Spain objected, al Ghanim responded by saying, "no, it was not a vote," and that he had instead been looking for a "feel of the room." That, obviously, is completely ridiculous, since he then used "the feel of the room" to say that the resolution was adopted, despite significant concerns about it. The Internet Society came to this meeting in the hopes that revisions to the treaty would focus on competition, liberalization, free flow of information and independent regulation - things that have clearly worked in the field of telecommunications. Instead, these concepts seem to have been largely struck from the treaty text. Additionally, and contrary to assurances that this treaty is not about the Internet, the conference appears to have adopted, by majority, a resolution on the Internet. Amendments were apparently made to the text but were not published prior to agreement. Given that the ITU's moves here more or less confirm many of the fears that have been raised about the whole WCIT process all along, and show that Toure's statements were simply untrue, why is it that anyone believes that the ITU has any credibility on this subject any more? The whole idea that we're now allowing countries with horrid human rights records, and with little to no experience in supporting innovation-enabling technologies, to control direction of these discussions suggests that the entire ITU process is broken beyond belief. The Web lets us speak out, share, and connect around the things that matter. It creates new opportunities, holds governments to account, breaks through barriers, and makes cats famous. This isn't a coincidence. It's because the Web belongs to all of us: We all get a say in how it's built. Mozilla has made it our mission to keep the power of the web in people's hands. But all this could change on December 3. Our governments are going to meet in Dubai to decide whether an old treaty, the International Telecommunication Union, can be expanded to regulate -- to control -- the Internet. The issue isn't whether our governments, the UN, or even the ITU should play a role in shaping the Web. The problem is that they are trying to do it behind closed doors, in secret, without us. We believe everyone should have a voice. And this site is to help you be heard in Dubai. The resources we are making available today will give you everything you need to learn about the upcoming meeting and why it matters, craft an effective message to get your government to listen, and engage in the global conversation about how decisions about the future of the Web should be made. Ultimately, 360,000 emails were sent by Mozillians to members of Congress, contributing a third of all the emails generated by EFF’s campaign site. The action that it is taking over WCIT isn't quite so drastic, and so is unlikely to have such a big impact. But the fact that Mozilla has once again cast aside it usual apolitical position to voice its concerns shows how great they are. In the past few days, a small number of media reports have characterized the United States as “threatening” to withdraw from the WCIT negotiations. These speculative reports are inaccurate and unhelpful to the Conference. The United States has made no such threat, and it remains fully committed to achieving a successful conclusion to the WCIT. To be honest, whether or not it's "helpful," it seems like it might actually be a lot more effective. As some are beginning to point out, almost everything about the ITU is a mess, and it's time that the US stood up and told it to stop messing where it doesn't belong. That article quotes former White House CTO Andrew McLaughlin describing why the ITU has no business regulating the internet. "What is so bad about the ITU?" Mr. McLaughlin asked in a speech to the New America Foundation in Washington on Nov. 29. "It's just simple things like the nature, structure, culture, values and processes of the ITU. They are all inimical to a free and open Internet, and they are all inconsistent with the nature of the technical infrastructure that now characterizes our communications networks." Voting rules let repressive governments "engage in horse trading that has nothing to do with the technical merits of the decisions under consideration." Indeed. So why are we even playing the game?